Yep, it was a "busted" forecast. That's the term meteorologists give to a mistake, a lousy forecast, sounds a little better than a "crappy outlook" or "horrific error." Monday was cloudier than we thought it would be, and a few helpful souls came up to remind me of the error of my ways. Where are these people when the forecast is accurate? Sorry to gripe (out loud) but here's a bulletin: we know when we're wrong, we realize when we've made a mistake, but some people (even friends and family) seem to delight in rubbing our noses in a crummy forecast. I guess it's a form of catharsis or something. For the record - "partly sunny" means exactly the same thing as "mostly cloudy" - we use it when we want to emphasize that there will be SOME sun on a given day (partly sunny implies that roughly 75% of the day will be overcast). There was a little sun yesterday, but you had to look long and hard to find it. As I sit here, munching on my crow souffle, let me give you an alibi/excuse, for what it's worth. Usually the atmosphere cools by 3 to 5 F. for every 1,000 feet you go up in altitude. Yesterday the "lapse" rate was sharper, ie: temperatures cooled much faster than average, due to a pool of unusually cold air swirling several miles above Minnesota. I thought there'd be some cloudiness (especially up north, closer to this cold-core low) but there was enough residual moisture floating over St. Cloud and the Twin Cities to make for a gray day. A "Dirty High." Even though the (automated) computer system printed out a big, fat high "H" over central Minnesota Monday night, skies were cloudy, unsettled, spitting a few sprinkles. The reason? Unusually cold air aloft, and a layer of moisture trapped 3,000 to 8,000 feet above the ground, resulting in a stubborn layer of stratus and stratocumulus. Lovely. Monday Almanac. What a difference cloud cover makes in early May. Highs yesterday ranged from a brisk 49 at Grand Marais to 55 in St. 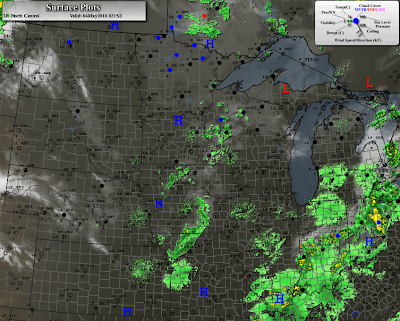 Cloud, 57 in the Twin Cities, and 61 down at Rochester. Had the sun been out temperatures would have been nearly 10 degrees milder. Better luck next Monday. Friday Evening "Hailers." 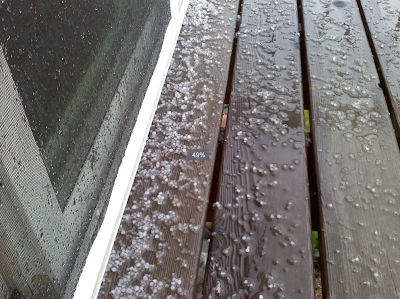 With unusually cold air aloft, the freezing level just a few thousand feet above the ground, showers and thundershowers were able to generate a few isolated reports of hail, mainly northwestern suburbs - reports of pea-size hail. As a rule, hail has to be 1" in diameter or larger to cause significant damage to car surfaces, windows or rooftops. Late PM Storms? An approaching cool front will destabilize our skies just enough to spark a few stray showers and T-storms by late afternoon and evening. The NAM model prints out a whopping .03", which is misleading. Some towns will see nothing, while 10 miles down the road some .25"+ amounts are possible. 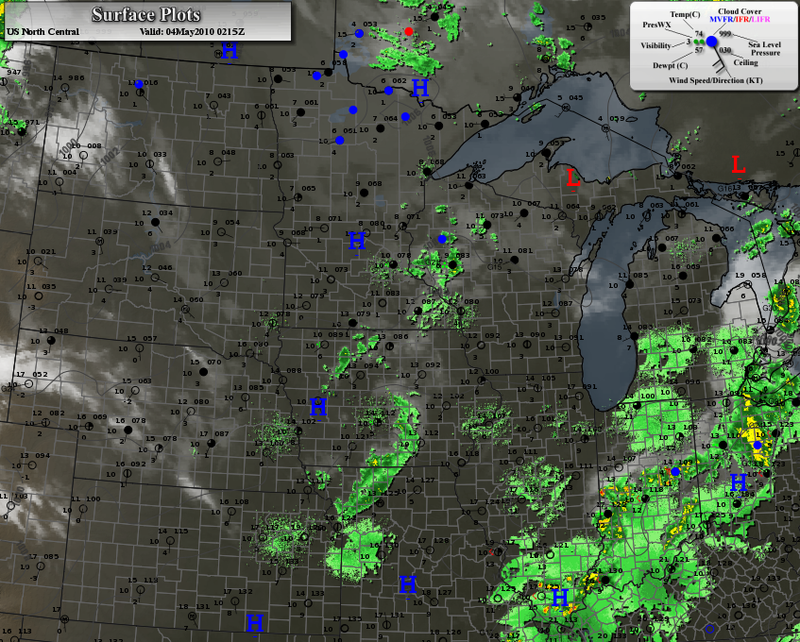 All or nothing - the joys of convective "showery" spring precipitation. Hey, if you're going to be stuck indoors focusing on work or school at least it helps when the sky outside is ragged and threatening, right? Or maybe I'm just rationalizing. We should (God-willing) have more sun today, a stiff south wind tugging temperatures well into the 70s by mid afternoon. Although Gulf moisture is limited, a few scattered showers and thundershowers may blossom by late afternoon or evening - the odds of severe weather are minimal, but a few heavier T-storms can't be ruled out, especially right around the dinner hour (when the atmosphere will be most unstable). Keep a light jacket handy - yes, now that it's early May our weather will feel more like early April, with a string of highs in the 50s from Thursday through the weekend, about 5-10 degrees F below average. A wave of low pressure rippling east along a stalled front may (still) sideswipe central and southern MN with a period of rain Thursday night into Friday morning, but it looks like skies will dry out Friday afternoon (probably ok for after-school activities Friday), and Saturday will be the nicer day of the weekend with ample sun, light winds (as high pressure drifts overhead) and highs holding in the 50s. A sunny start gives way to increasing PM clouds, another period of rain expected Sunday night into Monday. No question: we're in a cooler, stormier pattern, but the main storm track will remain to our south, keeping any sustained severe risk to our south as well, mainly over Iowa and Missouri in the coming week or so. White-Knuckle Friday AM Commute? The models show an area of low pressure sliding off to our south, raising the possibility of some rain Thursday night into Friday morning. The system should keep on moving, promising a drier, brighter sky Friday afternoon - late day activities should be fine (but extra-muddy). Compared to the apocalyptic headlines: gushing oil in the Gulf of Mexico, killer tornadoes in the Deep South, and the new (and incredible) "Lake Nashville" forming after 13-18" of weekend rain, we don't have much to complain about in the weather department. So far, we've been let off easy this spring. Let's see how long our luck holds out. Ecological Nightmare. It's the uncertainty that is worst - for anyone living in the Gulf of Mexico who makes a living from the water, for people living along the coast - even Floridians who may be impacted when prevailing westerlies return, pushing the slick toward Tampa and Sarasota, the uncertainty for plant, animal and aquatic life in the Gulf - officials keep saying it may take 3 months to cap the well. 3 MONTHS!! If that's true, then the Deepwater Horizon spill of '10 will dwarf the ecological disaster caused by the Exxon Valdez 20 years ago. This high-res NASA "Modis" image was taken on May 1, since then the spill has roughly tripled in size. Epic Flood. 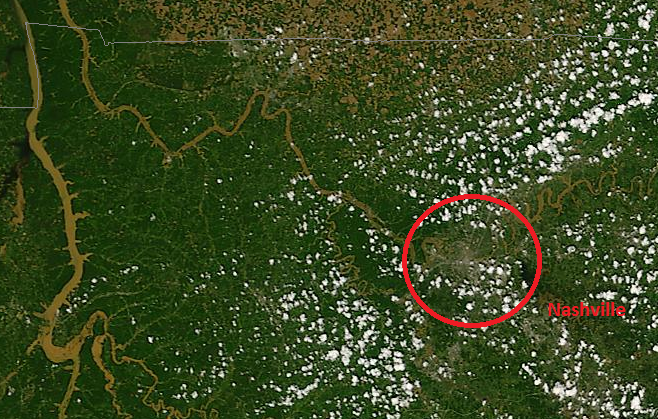 The Nashville flood is so large and extensive that floodwaters show up on the low-orbiting NASA "Modis" satellite. The brown smudge within the red circle is metro Nashville. See the high-res 200 meter image for yourself here. 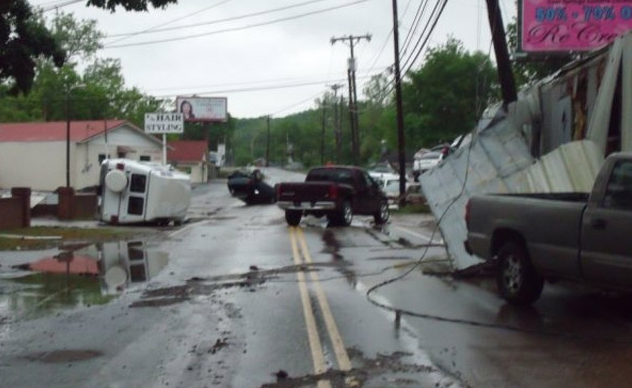 Flash Flood. This is what's left when the flood waters recede. 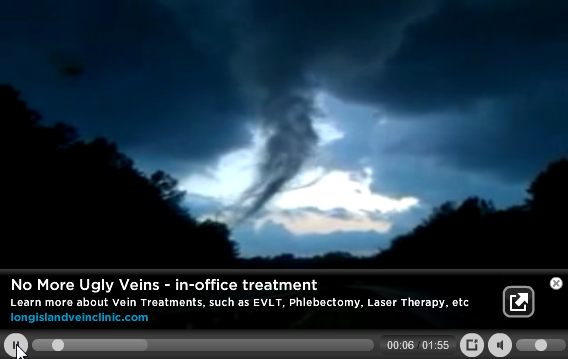 The photos and videos coming out of the Nashville area are incredible - and horrifying. Click here to see some of the most amazing flood images and videos I've ever seen in my 35 year meteorological career. Aftermath. 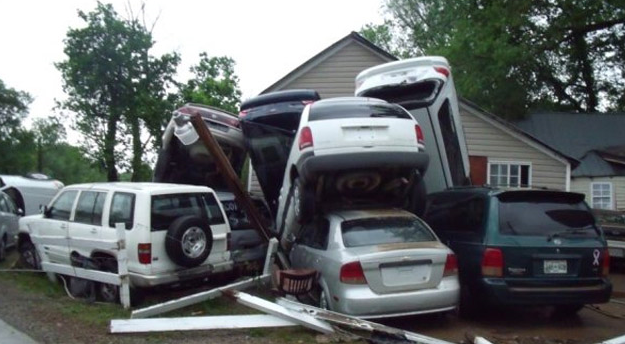 Another incredible photo from the Nashville area, which shows the amazing power of moving water - a battering ram of water and debris swept downstream, 20 feet deep in spots, enough to pile up cars like toys. Video of severe flooding on Interstate 24 is here. Plan B. 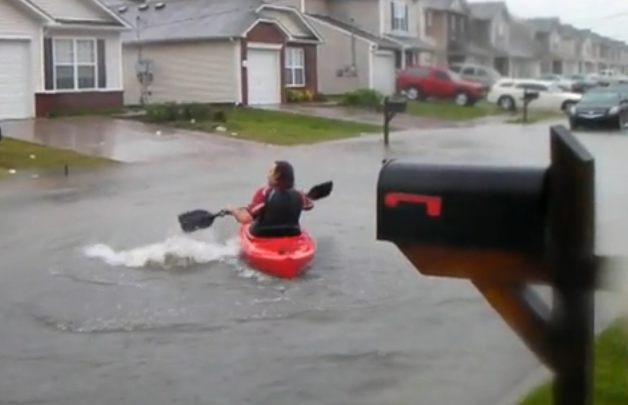 When you can't get the car out of the garage (because of waist-deep water from a 1 in 500 year flood) make the best of the situation, take the kayak out for a spin. More amazing videos are here. The Mother of All Gushers. It seems like every new day the news from the Gulf of Mexico gets worse. 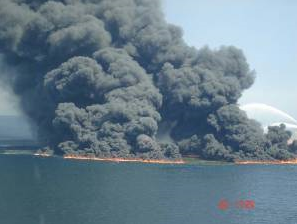 Authorities seem to be underestimating the size of the leak, the amount of oil flowing into the Gulf. What continues to go unreported is the threat posed to Florida - prevailing currents will (eventually) push the growing oil slick around the southern tip of Florida, where it may be swept up by the Gulf Stream, spreading up the Carolina coast - within a few weeks oil could (at least in theory) reach coastal New England. I know, hard to believe, but if it takes 2-3 MONTHS for engineers to figure out an effective way to plug the leak, the potential impact on not only the Gulf of Mexico, but much of the Atlantic ecosystem - will be incalculable. We are in uncharted waters. Aerial Views Shows Leak's Size. When a natural disaster shows up from space you know you have a problem. 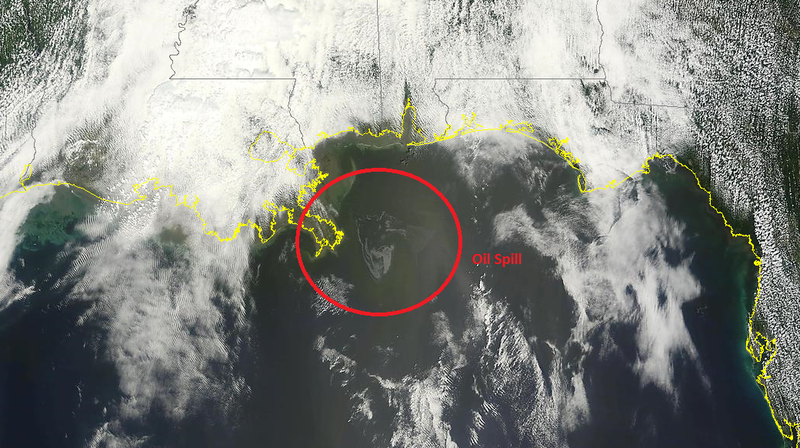 More on the scope of the oil spill in the Gulf of Mexico is here. NOAA estimates the leak is 5 TIMES LARGER than BP originally estimated a few days ago. Drill baby drill! Cataclysm. 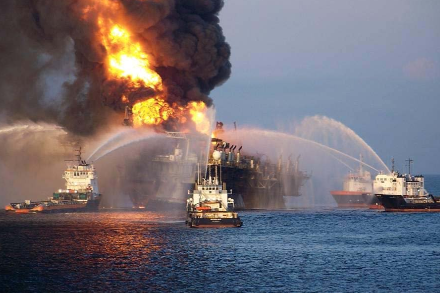 Click here to see a time lapse series of photos documenting the explosion of the Deepwater Horizon drilling rig, which subsequently caught on fire, sinking into the Gulf of Mexico, killing 12 workers trying frantically to extinguish the flames. Ironically BP had made a major new discovery, a massive new oil field 18,000 feet below the surface of the Gulf. 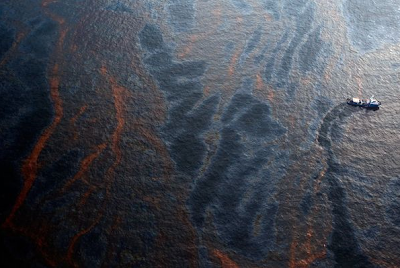 Deepwater Horizon was charged with tapping this new oil field. Yes, our addiction to oil and fossil fuels has lead us to this moment in time.